The key elements that comprise Competency Area #6 are outlined below. These can be used as touchpoints in determining whether your TA project helps advance your ACO or CP in this competency. ACOs and CPs actively develop, maintain a foundation of, and disseminate up-to-date knowledge in all areas relevant to building and running a high performing, sustainable MassHealth ACO or CP in order to ensure that their organizational strategies, population health and data analytics, use of innovative technology, and the care and services they provide for MassHealth members are grounded in current and emerging best practices, new thinking, and a solid evidence base. Evaluate and simplify administrative sustainability of ACO/MCO-CP Program: An ACO and a CP combine TA allocations to collaboratively engage a TA vendor to identify a range of evidence-based solutions for streamlining the coordination, maintenance, and updates to program logistics required for long-term sustainability of the ACO/MCO-CP partnership. The ACO and CP seek to evaluate not only processes to be implemented but also potential means by which to bridge health care and human services cultures. This project also addresses Competency Areas #1 and #5 in that it improves the ACO’s and CP’s ability to provide seamless systems of care for MassHealth members with complex needs. 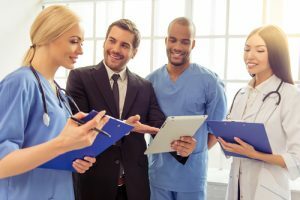 Catalyze new ACO care management processes: An ACO engages a TA vendor to provide care management expertise to leadership and existing care management teams as well as new DSRIP-funded staff. The ACO recognizes that the status quo must be disrupted in order for care teams to be equipped with tools and support and for members to be empowered and engaged. A new perspective and outside expertise will help to catalyze such a shift. This project also addresses Competency Area #1 in that the project will explicitly solicit and address the MassHealth member perspective and Competency Area #2 in that it will develop new capabilities among providers and care team members specific to new models of care. Examine best practices for legal policies that enable the integration of behavioral health and medical care within an ACO or CP: An ACO or CP engages a TA vendor to conduct an organizational review of privacy and protected health information (PHI) sharing policies and procedures in light of known best practices. Through this review, the TA vendor will identify possible revisions to privacy and PHI policies to further enhance the care of the members, especially with regards to transitions of care for members hospitalized both in and out of network. Assess tele-health tools for CP members: A CP engages a TA vendor to conduct an assessment of effective tools for tele-health in order to choose the best option for members to connect with care virtually. The CP leverages the organization’s Consumer Advisory Board to ensure that the perspective of members is an integral consideration throughout this process. The CP also works closely with both clinical and care coordination staff to ensure alignment of staff needs and feasibility of new workflows related to the various tele-psychiatry options. This project also addresses Competency Area #1 in that it explicitly solicits and integrates the MassHealth member perspective in care design and CP decision making, as well as Competency Are #2 as it addresses provider and care team priorities. Support ACO’s utilization management: An ACO engages a TA vendor for assistance in utilization management. The ACO wants to conduct a thorough review of the medical necessity, appropriateness, and efficiency of the use of health care services, procedures, and facilities for its MassHealth program. This project also addresses Competency Area #4 in that it advances the alignment of utilization criteria with financial and quality targets.